We are approaching “that time” of year again, the time to design Christmas cards so that there’s enough headway to get them printed, signed, addressed and mailed. Here is Visual Lure’s first design of the year, a card for TWM, a St. Louis Metro East engineering firm. 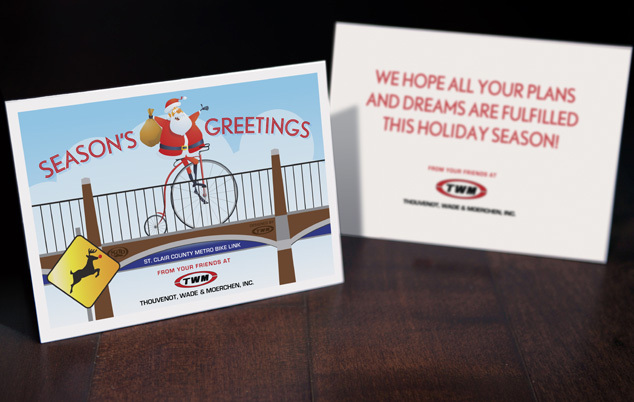 The card features Santa riding his bicycle on the St. Clair County Metro Bike Link, a bike trail designed by TWM that runs through Belleville and Swansea, IL. To make the card a little more festive, we added a Rudolph the Reindeer crossing sign.